Beginning on July 17th, 2015, two new Made with Magic devices went on sale at the Anaheim parks. 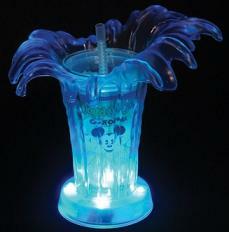 The device sold at California Adventure is the World of Color Sipper Cup. It's main function is to serve as a drink container. I found it to be rather awkward when trying to use it in that manner! That lip strikes me as being especially designed to hinder comfortable access to the straw. Forget about trying to drink out of it without the straw. The best solution seems to be to remove the inner liner cup and just use it like any regular cup and reserve the outer MWM portion for other uses. While the device is a bit awkward as a cup (and a real suitcase hog! ), it's really useful when it comes to reimagining for other uses. Let's take a look under the hood and see what makes this device tick. Removing the plastic top and inner cup liner and looking down inside the cup holder, the circuit board is easily seen in the base of the holder, along with a large decal warning that this portion of the device is NOT water tight. 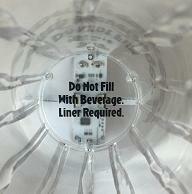 Good to remember - especially if this item happens to remind you more of a vase than a sipper cup! This device is consistent with some of the other newer MWM devices that have 4 RGB LEDs instead of the two found in earlier devices. Two of the LEDs are mounted directly on the main circuit board. The other two are on fairly rigid extensions. I found out, the hard way, that those extensions are NOT very flexible and break easily. The bottom of the device is where the battery holder and on/off switch are located. 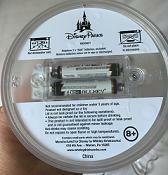 The device requires two AAA batteries to make the magic happen. Disassembly begins from the bottom. The decals conceal the three screws that need to be removed. Both decals need to be taken off. Pealing back those decals will allow easy access to those screws and allow removing the bottom part of the assembly. 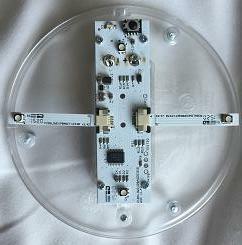 This is the core MWM assembly with attached battery power supply. To completely separate the PCB from the plastic bottom assembly requires unsoldering the battery terminals that extend through holes in the PCB. That seems to be a common arrangement found in the newer devices. To remove the top shell of the bottom assembly from the upper 'cup' portion simply requires unscrewing the readily apparent screws. The upper part of the bottom assembly can be screwed back on top of the bottom base and give a nice, compact MWM object that is really handy for many uses. For a more detailed image of the MWM board, click the smaller image to the left. The TI 430G553 processor for this device is the same as used in most of the other MWM devices. The IR receiver and two of the LEDs are mounted on the rigid PCB. The extensions are simply to provide the two additional LEDs. The mainboard LED respond to codes for the left ear and the extension LEDs respond to the right ear codes. This kind of subverts the whole left/right setup. The result is a diagonal response to specific ear commands which is a bit frustrating when hoping to preserve a strict right-left response from the device. Not going to happen here. Component D2 is an IR emitter. This device does emit MWM codes for device-to-device synchronization/standalone operation. The average time between emitted phrases is about 9.5 sec. The pattern changes every 2-3 minutes and appears to be selected by random. The same pattern may be chosen multiple times in a row. Here, ?? is a single byte argument for the continuously running 0C timer variable. CHK is the phrase checksum. Varying the 0C argument with each emission a common characteristic of devices that are designed to interact with one another. 99 42 00 00 48 17 0C ?? D0 0E 80 CHK is the one that gives that obnoxious white strobe-like effect. Luckily, most of the other MWM products interpret the 48 17 code in a more agreeable manner. The other offender is Chernabog. Maybe it's a Sipper Cup thing. Minimal. Last visit to California Adventure Park I was told these are no longer available unless attending the dessert party for World of Color. Reservations aren't easy to get and the gig is pricey.